I saw a photo of Rosa Parks in a display for International Woman’s Day and thought of the qualities that made her a great leader. 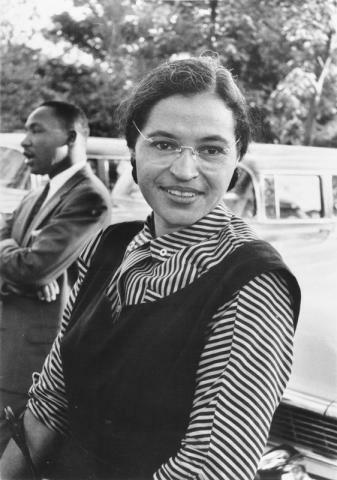 We know now that she developed gradually into her role, attending workshops and reflecting carefully about the problem of segregation and how to effectively demonstrate in opposition to it, long before she refused to give up her bus seat on December 1st, 1955. Though she was always clear that “she was tired of giving in” — not physically tired — her demeanor and method of protest fostered sympathy and a consideration of our shared humanity, even among her opponents. Further, she was willing to utilize her strengths as an introvert. Her whole life exampled dogged determination, as well as, a willingness to let others take the spotlight. Notably, she teamed up with Martin Luther King and complimented his more outgoing leadership gifts.